Hear the term "Tyvek" and building wraps and Priority Mail envelopes invariably come to mind. Unless, of course, you're Israeli designer Hila Martuzana, who harnessed the material's textile-like properties to create a series of garments, instead. Composed of strips of Tyvek, wrangled to accommodate the human form, Martuzana's four-piece "Rhythm of Paper" collection exists at the intersection of performance art and haute couture. More than that, each dress embodies the transitioning seasons—spring to summer, summer to fall, fall to winter, and winter to spring—and the changes they usher in their wake. Although the pieces appear delicate, Tyvek is extremely durable. Pioneered by Dupont, the material is also moisture-, chemical-, and tear-resistant, which explains Tyvek’s popularity in the construction and science industries, where you can find it in siding, automobile covers, and laboratory gear. Because it’s derived from high-density polyethylene, Tyvek can be recycled or safely incinerated without leaving behind any residue for disposal. Although the pieces appear delicate, Tyvek is actually extremely durable. Unlike conventional fabrics, Tyvek also allowed Martuzana to give her garments a “sense of sculpture.” “I wanted to bring together the body with unconventional material,” she adds. Although the pieces appear delicate, Tyvek is extremely durable. Pioneered by Dupont, the material is also moisture-, chemical-, and tear-resistant, which explains Tyvek's popularity in the construction and science industries, where you can find it in siding, automobile covers, and laboratory gear. Because it's derived from high-density polyethylene, Tyvek can be recycled or safely incinerated without leaving behind any residue for disposal. Martuzana discovered the material's unique qualities after experimenting with different forms of paper and fabric. “I discovered that the Tvyek paper is not torn, but it can be cut, folded, and heated," she tells Ecouterre. "These are the techniques I used to create the textile surfaces." 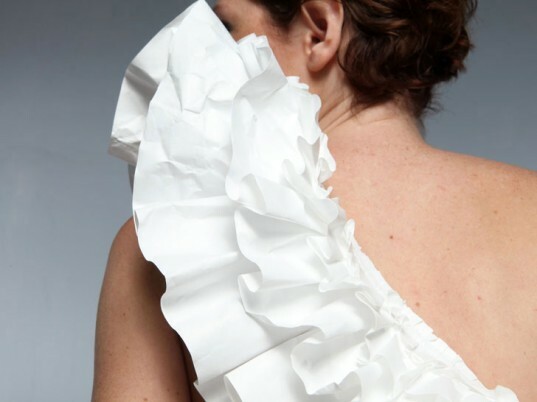 Unlike conventional fabrics, Tyvek also allowed Martuzana to give her garments a "sense of sculpture." "I wanted to bring together the body with unconventional material," she adds.